The Rosemary House Bed and Breakfast ,what a perfect name for a B&B because rosemary means remembrance and friendship, the essence of what B&B hospitality is all about. Add some southern charm, lazy days on a front porch rocker shaded by gigantic sugar maples and you have The B&B Team’s newest Inn for sale. 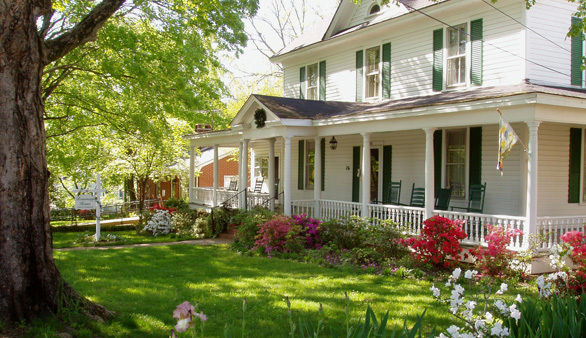 Smack dab in the middle of North Carolina, the Rosemary House Bed & Breakfast is located in the small but mighty interesting town of Pittsboro, North Carolina. I love when we get a new listing and I can delve into some research on the location, usually a place I have never visited. And this location has ‘come for a visit’ written all over it! I have discovered that many people do visit and many of them stay at the Rosemary House. It is a successful business in a prime location. Who could ask for anything more? One aspect I liked about the town of Pittsboro specifically is the historic preservation of it’s downtown. The S&T Soda Shoppe is a great example and offers a real nostalgic pull. Give me a stool at a vintage marble counter, a hamburger and fries in a red plastic basket and a hand made milkshake and I’m a happy girl. Sorry I don’t have a link to their website because they don’t have one, that’s how old fashioned they are! 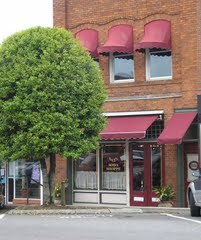 Pittsboro is just outside of Chapel Hill, home of the University of North Carolina at Chapel Hill and UNC Health Care. The town and surrounding area has a vibrant music scene, great restaurants and for you golfers, five courses. We all know that innkeeping is not for retirees even though many aspiring and new innkeepers are rumored to be in that general age bracket! But all the attractions and services mentioned here are what retirees often look for in a lifestyle change. The B&B Team believes that innkeepers can enjoy the merits of both lifestyles. Own and profit from a business like the Rosemary House and enjoy the pastime pleasures of almost year round golf, great home grown local southern flavors, the cultural attractions of a vibrant university town and a good milkshake. Southern Lifestyle, Rosemary House style! No mater what your age chronologically, the Rosemary House Bed and Breakfast is a great opportunity. A manageable B&B of a lifestyle size with financially viable income. 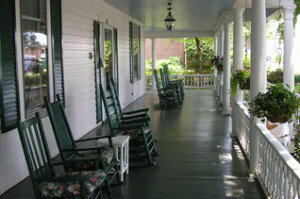 The B&B Team is proud to represent this lovely Inn that represents the essence of remembrance and friendship. This entry was posted on Friday, December 7th, 2012 at 10:07 pm	and is filed under Better Way to Buy and Inn, Innkeeping Business. You can follow any responses to this entry through the RSS 2.0 feed. Both comments and pings are currently closed.